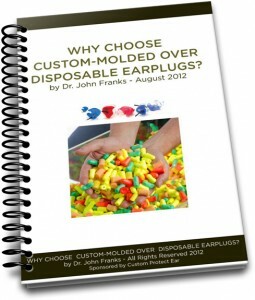 Why Choose Custom-Moulded Over Disposable Earplugs? Custom-moulded earplugs, sometimes called Personalized Hearing Protection, are just as, if not more, effective for the prevention of noise-induced hearing loss as are disposable earplugs. There have not been head-to-head studies of the relative effectiveness, but two major long-term retrospective studies of the effectiveness of hearing loss prevention programs can provide insight. In 1989 Franks, Davis and Krieg (Franks, 1989) reported that noise-exposed employees of a company that provided custom earplugs to all of its employees had changes in hearing over a ten-year period that were no different from their non-noise-exposed colleagues and peers. The company had six facilities around the United States with noise-exposed employees as well as a cadre of employees of similar age and gender who were not exposed to workplace noise. All of the employees studied had been with the company for the ten-year period studied. Audiometric, health and hobby histories, as well as noise-exposure levels were known for all employees. A ten-year segment of the records was used for the analysis. In 2011, Heyer, et al. (Heyer N, 2011) reported a retrospective analysis of hearing conservation programs for three different companies, all of which relied upon premoulded or slow-recovery foam disposable earplugs to protect employees from noise-induced hearing loss. One company made automobile body components, one made automotive parts, and the third was a major food processing company. All of the employees had been at the study sites for longer than the period of time studied. Noise-exposure and hearing protector use histories were established for each employee as were audiometric records including relevant medical and hobby histories. In this study there was not a cohort of fellow non-noise-exposed employees, so the outcome was compared to a standardized set of data (American National Standards Institute, S3.44-1996 (R 2006)). The noise-exposure levels in the three companies studied were similar, as were they to the noise-exposure levels in the Franks, et al. (1989) study. Heyer, et al. found that two factors were associated with changes in hearing: age and noise-exposure level. Because of the strong effects age and noise-exposure level had on the data, it was not possible to assess the influence of other factors. Had the pre-moulded disposable earplugs been used as effectively as the custom-moulded earplugs, then noise-exposure level should not have been a main effect associated with changes in hearing; with age factored out, noise-exposure level was as much a primary risk as would be expected for the unprotected. 1. What is a custom-moulded earplug? A custom-moulded earplug is a laboratory-made earplug made from moulds taken by trained experienced impression takers. In North America the experienced impression takers may be audiologists, licensed hearing aid dispensers, or impression takers well trained by the manufacture. Most often, these are made of acrylic or soft silicone that can fit the ear and the ear canal tightly. The advantage of the softer earplugs is they change shape slightly as the wearer’s ear canal changes shape when talking or chewing, thereby continuing to seal during those activities. The custom-moulded earplugs are typically delivered in a protective storage/carrying pouch and will be accompanied with a tube of lubricant (most often petroleum jelly). The lubricant is applied to the earplugs during their initial use/break in period. The lubricant makes the earplugs easier to insert and also softens the interface of the earplug and ear improving comfort. After about ten or so uses with the lubricant applications can stop as the silicon should have absorbed enough material to be easily inserted for the life of the earplug. Various styles of custom-moulded earplugs are shown in Figure 1. 2. What is a disposable earplug? So-called “foam” and pre-moulded earplugs are designed to be used for one time or in some cases, a few times. Exceptions to this restriction are those very expensive earplugs such as the Hi-Fi or military earplug that can be cleaned for repeated use. 3. When is a “custom-moulded” earplug NOT “custom”, but really a long-term use disposable earplug? Simply put: Earplugs directly made from the impression materials, which can be considered as fitter-formed or mould-in-place, are not custom-moulded earplugs (Lake, 2012). This is true for a variety of reasons. First and foremost is the impression material. Impression materials now used for laboratory-made custom-moulded earplugs are designed for the purpose of taking the impression and holding shape whist in transit to and whilst being processed to make moulds by the laboratory. Fitter-formed impression material is intended to become the final product and so it “cures” while setting during the impression process. In order for this to work, the fitter-formed impression material is more viscous than impression materials used for laboratory-made custom-moulded earplugs. As such, the likelihood of an impression free from flaws and with a faithful rendering of the shape of the concha and helix as well as the pinna and ear canal is small. The impression for the laboratory-made custom-moulded earplug is also usually a silicone product made from mixing a base putty with a liquid or gel activator. Some laboratories use two-part silicone materials that combine catalyst and silicone in 50/50 proportion. The result is far less viscous material than used for the fitter-formed products; its viscosity is such that it may be put into a syringe for injecting into the ear canal and concha and helix of the pinna. Second is the impression process. Fitter-formed products use putty created from combining a base putty with a liquid activator and then folding them until blended. That putty begins to cure immediately but has less-than a three-minute time window when it will be malleable. The putty is rolled into a cylinder and the pushed down the ear canal and padded into the concha and helix of the pinna. Once it seems to have cured, it is removed from the ear and trimmed. Handles or the ends of cords may have been attached after the insertion but before the impression cured. For a custom-moulded laboratory-made earplug, following otoscopy, a cotton or foam dam is placed into the ear canal with its placement confirmed by otoscopy so that there is no chance for the impression material to travel deeply enough to make contact with the eardrum. As well, if the ear canal has excessive cerumin, the ear canal may be cleaned by the audiologist taking the impression or the person may be referred to his or her own physician to have the ear canals evaluated and cleaned – the exact procedure depends on locality and regulatory requirements. Then, the impression material is injected to fill the entire ear canal between the dam and the opening of the canal behind the tragus and finally the bowl of the concha and the helix are filled. There is a debate over whether the mouth should be closed, opened, or slightly opened during the time it takes for the impression material to set. The mouth slightly open (relaxed or with a bite block of 20 mm or so that) has been shown to provide better bass than mouth closed when the earplug is modified to be used with insert earphones. There have been no published studies of the differences in noise reduction between laboratory-made custom-moulded earplugs made from mouth-relaxed versus mouth-closed impressions. Once the impression material has set, it is carefully removed from the ear, inspected to make sure there are no creases, ridges, or other malformations, and put into a package to be sent to the laboratory. There is no trimming done by the impression taker. The experience and training of the impression taker is also very important. Depending upon locality and professional licensing regulations, the impression taker may have been trained by the laboratory making the custom-moulded earplugs, or have academic or clinical training in impression taking. In any case, once the impression reaches the laboratory, its staff can determine the quality of the impression and may ask for a second impression if the first has flaws that the laboratory can’t adjust. Already in the hands of some audiologists are laser scanners that can make a digital image of the impression, and the image goes to the laboratory for further processing to make the mould from which the earplug is made. As the image is stored digitally, so long as the file is not corrupted, it is possible to make as many earplugs from one impression as necessary for as long as is necessary. Soon to come will be digital imaging of the ear canal and pinna, so that there will be no use of impression material, as the image of the ear will be sent to the laboratory to be process into an earplug. Either of these techniques should remove impression making from the hands of amateurs and DIY’ers. 4. What are the advantages and disadvantages of custom-moulded earplugs? As stated above, between the trained and experience impression taker and the technicians at the laboratory that makes the custom-moulded earplugs, there is a guarantee that the ear canal, concha, and helix portions of the ear were accurately obtained. The laboratory can also determine the impression material didn’t distort that ear and ask for a new impression as well. It is in the laboratory’s best interest to ensure that the custom-moulded earplugs that are shipped will fit its user perfectly, provides the desired amount of noise reduction, and is comfortable to wear. Uncomfortable earplugs, custom-moulded or not, will either not be used or “field modified” by the wearer to achieve comfort, defeating the entire hearing loss prevention programme in the process. The custom-moulded earplug’s silicone material will last between three and five years, or longer, depending upon care and handling. Custom-moulded earplugs are that are regularly cleaned last longer than those that aren’t. Rinsing earplugs under warm water is often sufficient for cleaning. If desired, a mild soap solution may be used. Products that have detergents or solvents as bases should not be used to clean custom-moulded earplugs since they may damage the earplug over repeated use. Whether too large or too small for disposable earplugs, custom –moulded earplugs can be made to fit any healthy ear; any ear free from drainage. Even ears that have unusual shapes due to birth trauma, disease, or surgery can be fitted successfully with custom-moulded earplugs if there is any ear canal present at all, whereas disposable earplugs are designed for normally shaped pinnae and ear canals. If the custom-moulded earplug is lost or damaged, it can be replaced without the need to acquire a new impression. All that is required is for the company making the earplug to maintain the impression or mould on file. Then the wearer can contact the maker for a replacement. No new impression is required. After more than five years, a new impression should be taken in any case. The pinna is one body part that continues to change with ageing as it is comprised of 100% cartilage (Ferrario VF, 1999). Thus, the earplug that worked at age 25 may not be as effective in noise reduction at age 31 years. Just to make the issue less comfortable, the soft tissue of the nose also grows with ageing. Custom-moulded earplugs can be made with filters so that the amount and type of attenuation (noise reduction) delivered is no more or less than needed. While a solid custom-moulded earplug may be able to provide about 25 to 30 dB of noise reduction, filters can be inserted into a bore drilled through the earplug that will allow its noise reduction to be lowered to a desired level. A person working in less than 90 dBA of noise may need only 15 dB or so of noise reduction, and filters are available to reliably provide this. Of course, custom-moulded earplugs with filters need more attention to care than solid custom-moulded earplugs so that the filters don’t become blocked with soil or saturated with liquids. Cleansing of these is best done with damp cloth rather than by rinsing or submersion. Once inserted, users of custom-moulded earplugs are as physically aware of the earplug as they are of a watch or ring. As the custom-moulded earplug was made from a non-distorted impression of the ear, it should fit perfectly in the ear with no sensation of pressure. This is seldom the case for disposable earplugs that must apply pressure to the ear canal walls for effectiveness. Our physiology helps with allowing custom-moulded earplugs to be more comfortable than disposable earplugs. The pressure neurons in the skin, for light pressure, are state-of-change detectors so long as skin is not compressed or distorted. Thus, once the custom-moulded earplug is seated, the neurons cease to be active. However, it is a different case for most disposable. In order to be effective, they must be compressed to a degree, thus compressing the skin of the ear canal up against the bony wall of the ear canal. While not necessarily causing pain, seldom will the wearer be unaware of the physical sensation of the presence of the disposable earplugs. When a disposable earplug is worn so that it is comfortable, it is usually being worn incorrectly. Custom-moulded earplugs have a break-in period for the first ten or so uses that requires the application of lubricating gel (petroleum jelly). When the silicone of the custom-moulded earplug is first removed from curing, it is extremely smooth and dry. As such, the silicone tends to not side easily over the skin. The petroleum jelly when conservatively applied to the custom-moulded earplug allows the earplug to be smoothly twisted into place. After ten or so uses, the surface of the earplug will slide more easily over the skin of the ear canal and pinna and seat well. If the custom-moulded earplug is cleaned with warm water and a cloth or even non-detergent soapy water, it should maintain its ease of fit. If somehow, a detergent is used to clean the custom-moulded earplug, then it may be necessary to resort to a re-break-in period. Custom-moulded earplugs are twisted into place with the canal portion inserted first and with the earplug rotated backwards to settle in the concha (bowl) portion of the pinna and to make sure the helix portion (if included) locks in. This is different from how disposable earplugs are inserted – pulling back on the pinna with the hand opposite the ear being fitted and then pushing the earplug into the ear canal, followed by releasing the pinna to bring the ear back to its “natural shape”. It takes a little time to learn to put in custom-moulded earplugs, but once the task is learned, putting them into the ear becomes an almost non-conscious activity. Custom-moulded earplugs are never removed by pulling straight out, even with lifting the pinna. They are by removed by reverse twist, rotating forward so that the helix portion (if included) and the concha (bowl) portion are cleared before the canal section is pulled out. Were a custom-molded earplug to be removed by pulling it directly out of the ear, the vacuum created in the ear canal could damage the eardrum. There is a perception custom moulded earplugs are more expensive and therefore must be used “sparingly” in a Hearing Conservation Program. The business aspects of using custom moulded hearing protection are in Section 5.2.3 following. 5 What are the advantages and disadvantages of disposable earplugs? Disposable earplugs are good for short-term, one-time use such as in cases when protection is needed only occasionally and not regularly. A person who does not normally work in a noisy area may procure a pair of disposable earplugs to use while working in the area for only a short time or while transiting through the area. A box of 200 pairs of disposable earplugs cost less than $30.00 USD. In a facility where most employees are using custom-moulded earplugs, that box could last almost until its expiration date. Most premoulded disposable earplugs have expiration dates. The chemicals that keep them supple enough to use eventually gas off so that the earplug becomes too stiff to be inserted into the ear or too unresilient to roll into a smooth column for insertion into the ear. Regulatory bodies require that employers provide various types of hearing protection for noise-exposed employees and thus even in the case where 100% of noise-exposed employees are using custom-moulded earplugs, some disposable earplugs need to be kept on hand for exceptions such as mentioned above or for the employee who has yet to receive his or her own new or replacement custom-moulded earplugs. The manufacturers of disposable earplugs have historically provided brief instructions and laboratory and field studies have shown the users did not get the amount of noise reduction – protection – that was expected. Recently major manufacturers have developed YouTube presentations to show how to use their earplug correctly. In the absence of carefully watching the demonstrations and attempting to follow them, most users only partially insert the earplug. Those who achieve a complete insertion of the earplug will obtain as much protection as is available from a custom-moulded earplug. Of course, for extremely short periods of time, a 25 dB noise reduction can be achieved by pushing down on the tragus with the index finger; suitable if the task-at-hand can be done “hands free’ (Holland, 1968). Some disposable earplugs come with filters that attenuate impulsive noise (weapons fire, banging surfaces such as hammers) or provide “tuned” or “flat” attenuation. These products cost 100 times more than the conventional disposable earplug. Since they can’t be used 100 times more than a similar disposable earplug without the filters, cost becomes a significant factor. Disposable earplugs may be uncomfortable to use as intended. Discomfort is the most common complaint of survey users and most frequent reasons earplugs are not fitted “correctly” by the user. The second most common complaint is that hearing protectors interfere with the users’ ability to understand speech of fellow workers or hearing their equipment properly (Byrne DC, 2011). More noise reduction than is necessary making user feel isolated from environment and often resulting in user removing the earplugs in order to hear fellow workers or equipment. Over protection is another reason for workers not using their hearing protectors “correctly” (Williams W, 2005). As mentioned above, discomfort is the primary complaint about disposable so that necessary noise reduction is not provided to avoid discomfort. Common complaints are ear pain, headache, and fatigue. The result is that these poorly fit earplugs result in increased noise-exposure and may actually turn the ear canal into a tuned resonator so that the noise level under the earplug is higher than outside the ear; noise dosimetry results are rendered irrelevant. It has been observed in field studies that people who incorrectly wear insert hearing protection may continue to do so even after receiving training on how to correctly use the disposable earplug (Davis, 2008). There is a presumption the disposable earplugs, if correctly inserted, will work for anyone. The challenge is only to teach users to correctly insert them. There are ear canal shapes that just will not seal with a disposable earplug. The challenge is that once a user fits a disposable earplug as best they can, and continues that fitting for years, the “feeling” they get from that earplug denote a proper fit to them. If initially they were fitting it incorrectly, it is very difficult to unlearn that perception. Switching to Custom Fit restarts the perception of fit. 6.0 Who should be fitted for custom-moulded earplugs? Usually, company policies of providing custom-moulded earplugs to only those who are “difficult to fit” with disposable earplugs, while having face validity, are ineffective, more costly, and may not result in desired outcomes. Use of custom-moulded earplugs with knowledge of noise-exposure levels or dosimetry data can allow earplug construction most appropriate to provide adequate protection, but not over protection. Users who are getting appropriate noise reduction with necessary attenuation do not feel cut off from their environment. The sense of isolation is common with users of disposable earplugs. Consistency of the fit insures the comfort of the earplug – no more noticeable than wearing a ring or watch. American National Stanard Institute. (S3.44-1996 (R 2006)). Determination of Occupational Noise Exposure and Estimation of Noise-Induced Hearing Impairment (with Erratum). New York, NY: American National Standards Institute. Byrne DC, D. R. (2011). Relationship between comfort and attenuation measurements for two types of earplugs. Noise and Health, 13(5), 86-92. Davis, R. (2008). What do we know about hearing protector comfort? Noise Health. 10(40), 83-9. Ferrario VF, S. C. (1999). Soft tissue facial growth and development as assessed by the three-dimensional computerized mesh diagram analysis. Am J Orthod Dentofacial Orthop. 116(2), 215-28. Franks, J. D. (1989). Analysis of a hearing conservation program data base: factors other than workplace noise. Ear and Hearing, 273-280. Heyer N, M. T. (2011). Heyer N, Morata TC, Pinkerton LE, Brueck SE, Stancescu D, Prince Panaccio M, Kim H, Sinclair JS, Waters MA, Estill CF, Franks JR. Occup Environ Med. 68(7), 510-517. Holland, H. H. (1968). Attenuation Provided by Fingers, Palms, Tragi, and V51R Ear Plugs. Journal of Occupational Medicine. 10(2):, 104 – 110. Lake, S. (2012). Custom Designed and Manufactured Hearing Protection: History, Terminology and Beneﬁ ts to Corporations and Hearing Conservation . Spectrum VOLUME 29, SUPPLEMENT III. New Orleans: National Hearing Conservation Association. Murphy, W. F. (2000). Four protectors in search of a rating system. . Ear and Hearing, 21;3,, 167-178. Williams W, D. H. (2005). Hearing protector performance and standard deviation. Noise Health: 7(28), 51-60. Dr. John Franks former head of the Hearing Loss Prevention Section of the National Institute of Occupation Safety and Health prepared the attached “White Paper”. By way of disclosure, Dr. Franks sits on Custom Protect Ear’s scientific advisory council. The research sited by Dr. Franks stands for itself. The conclusions drawn from that research are Dr. Franks and have not been altered or amended by Custom Protect Ear. For further information about what can be done to take into account of the issues raised by Dr. Franks and properly constructing an effective hearing loss prevention program, please contact us. Click here to read Dr. John Franks Bio.